There are numerous legends and hypotheses regarding the origins of the Santa Croce Church, amongst which, one of the most accepted is by the Count Volkhold della Pusteria. It is said that after returning from a pilgrimage to the Holy Land the count decided to donate all his belongings to the Benedictine nuns of Sonnenburg in Castel Badiato and retire as a hermit and spend the last years of his life at the foot of Monte S. Croce. Here he built a small chapel, on what was believed to be a former place of pagan worship, where apparently only a wooden crucifix was originally placed. Based on existing documentation the little church was consecrated on May 18, 1484 by the Bishop Konrad of Bressanone. Later in the mid eighteenth century it was restored and enlarged and the bell tower was built. The adjacent house was built in 1718 and served as a dwelling for the sacristan and as a refuge and resting place for the numerous pilgrims that came from afar. In 1786 under the rule of Emperor Joseph II of Austria, the church was deconsecrated and then closed and eventually used by shepherds as a sheepfold. In the meantime the local people always had at heart the sanctuary and Pietro Paolo Irsara, a farmer from Badia, took on the task of renewing the church and managed to reopen it. In 1839 the decree to reopen the church was finally issued and the following year on June 15, with the local people’s huge participation and enthusiasm, the sacred image of Christ carrying the Cross was brought to the sanctuary from the St. Leonardo church where it had been for 54 years. The tradition still continues today, and every year in early June the statue of Jesus carrying the Cross is brought from St Leonardo to the S. Croce Sanctuary with a solemn procession, and it stays there until October. During the summer two important religious celebrations take place: the St. Anna feast on July 26 and the St. Bartholomew feast on Aug. 24. In 1982/83, the church was once again restored with the help of the local people and the Tavella painters. On the 17th of June 1984 the 500-year jubilee was celebrated. S. Giuseppe Freinademetz di Oies – Badia celebrated the Holy Mass numerous times at the S. Croce Church. During the Holy Year in 2000, the Sanctuary was nominated a Jubilee Church. For several years now, the Church remains open during the winter season for the many tourists and pilgrims. 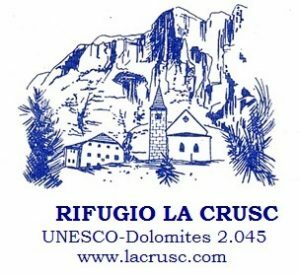 A kind and warm thank you is sent out to all those who made offers to the Santa Croce Sanctuary.